Dyed in the wool and hand-spun in Shanghai by Zuo and her Mom in Shanghai (you can read more about them in the “about” section of our website), these handspun yarns are a treat to work with. 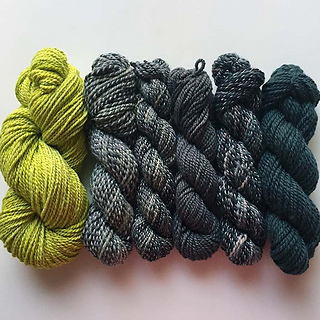 They’re spun using a short draw technique to yield a soft, dense yarn which knits up into a rich, drapey fabric. Orbit Heather - spun from a soft and springy Merino wool, Orbit Heather brings great stitch definition and a squishy, dense handle to any knitting project. Halo Heather - the softest yarn in Infinite Twist’s line, Halo Heather takes its name from the gorgeous bloom of fibers it develops after blocking. It’s next to the skin soft, and a great choice scarves, shawls, and other accessories. Cosmos - Spun from carded Merino batts with a hint of sparkle and silk. Halo Shine - one strand of Halo Heather, one strand of chain plied rayon. Shiny and drapey! 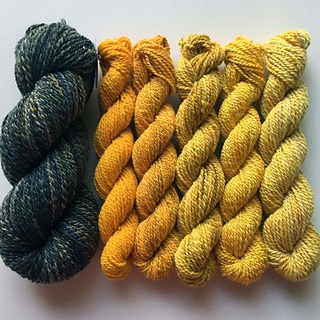 Available in our kits and Handspun Samplers.